Mr. Zook, a native of the Missouri Boot Heel, graduated from high school in Wilson, Arkansas. Having grown up in the Delta, he knew what struggle was like. 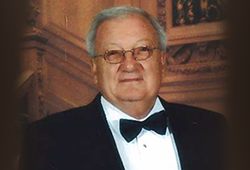 He graduated from then- Arkansas State College in 1955 with a degree in business administration. Mr. Zook went on to have a long career as an administration manager with IBM Corp. in San Diego and is now retired and enjoys watching the Red Wolves play from his home near Phoenix, Arizona. His gift comes from his wise investing through the years and allows Arkansas State to invest in students using unrestricted funds to further the mission of the university.